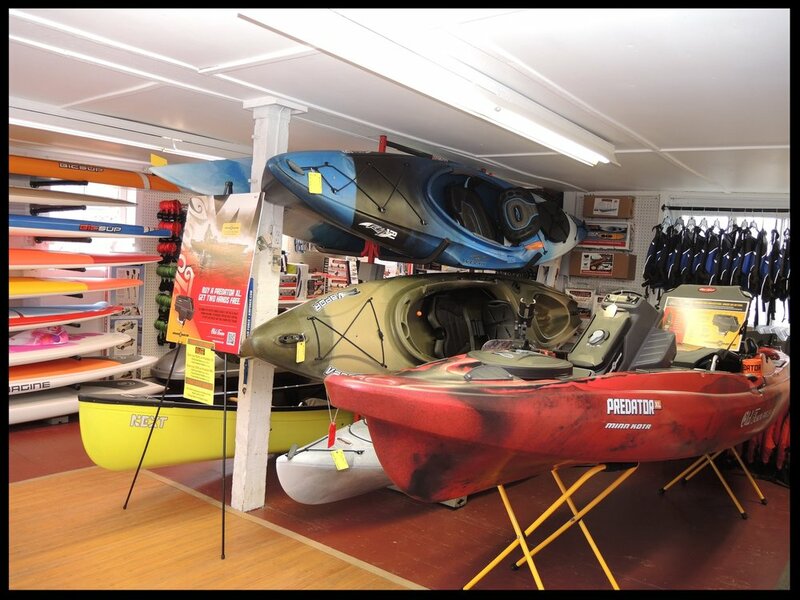 Visit our shop, located on the water. This sporty kayak series offers a stable, efficient and comfortable ride. A large cockpit opening offers ample room to move around. These high volume kayaks can really pack a load. Perfect for anglers, sportsmen and recreational paddlers alike. The Rip a lively, playful beginner to intermediate kayak designed to help grow paddling skills without sacrificing fun on the water. New for 2014 is a built in drop down skeg making the Rip both agile and maneuverable. Introducing the world's most advanced recreational kayak. 20 years ago Old Town canoe changed the way paddlesports thought about recreational kayaks with the Loon Series. Now, meet the next generation. Also available in Angler models. The time-tested Dirigo is beloved for its friendly, easy-to-paddle nature. A roomy cockpit and excellent initial stability make this series a perfect choice for almost anyone. This series of outstanding touring kayaks has excellent tracking, performance, glide, and overall handling characteristics. Each Looksha is shaped and meticulously constructed with all-day comfort and enough room for all the gear a trip calls for. If there was one type of kayak that could meld sea touring hull design with the stability and comfort of a recreational kayak, the Manitou series is it. They are at home on a calm lake, or rough coastline. It’s hard to think of a more well-rounded series! A playful and comfortable craft, the Elias offers a performance fit cockpit that enables paddlers to 'grip' the boat for edging and lean turning while still maintaining an easy feel for the more casual paddler. Good primary stability and excellent secondary stability. Coastal play boats built to tame the biggest conditions – high winds, surf, and more. These kayaks offer the ultimate in stability and handling on edge. Chathams are the ultimate performers in rough water conditions where high wind and rough seas prevail. Are you looking for compact, affordable fun kayak for everyone in the family? Take a look at the Frenzy. It has the stability, a strong keel line for good tracking in a compact craft. It’s the kayak that people keep for a lifetime. Here are some of our happy new kayak owners!